Everything you need to build a car rotisserie is in these plans. 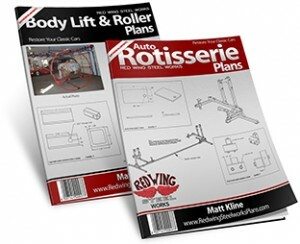 I have 3 different sets of plans available both the auto body rotisserie and the body lift and roller. I also include body lift and roller instructions that will show step by step how to use it to remove and flip your car body. The plans are in a PDF file so you can print them out and go to the garage and start building your project right away. They come with a complete material list and cut list so you will know precisely what you need to get in order to get started. All I ask in return is that you read and follow the short terms and conditions. Good luck and have fun.